While it may seem intimidating to rent a car and drive the roads of another country, especially if you don’t speak the native language, one of the most efficient ways for visitors to take in the breadth and depth of southwest Germany's breathtaking castles is by driving. One of the advantages of driving in Germany as opposed to, say, the U.K., is that cars are driven on the same side of the road as in North America: the right side. And with many (if not all) street signs using universal symbols in addition to text in the local language, winding through beautiful countryside can be quite enjoyable and not overly difficult. In addition, the routes are lined with restaurants serving local fare, and charming hotels that beckon weary travelers. My wife and I realized the possibilities of such an approach while taking a Rhine River cruise through a UNESCO World Heritage site just west of Rüdesheim. The well-maintained roads along the banks of the river would have allowed us up-close and personal views of many of the castles and the towns in between. 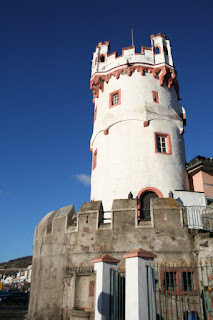 Accordingly, I was pleased to receive an email from the State Tourist Board of Baden Württemberg, presenting a potential itinerary for exploring that area’s castles. “Taking in the castles and gardens of Baden-Württemberg is going back in time to experience worlds of glorious art, architecture, collections of porcelain, tapestries, statuary and acres of elaborate gardens,” the communique said. 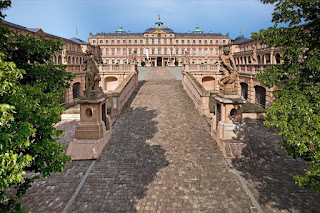 "The Staatliche Schlösser & Gärten (SSG), the state heritage preservation agency for the state of Baden-Württemberg, or southwest Germany, preserves, protects, develops and maintains 60 historic monuments, including famous places such as Heidelberg Palace in the north but also lesser known gems, such as Weikersheim Palace in the northeast, or the luxurious Salem Monastery and Palace on the Lake Constance in the south." Detail-oriented travelers will notice that some castles are called Burgs while others have the word Schloss in their name. Generally, a "burg" is a fortress, designed for defense in battle, while a "schloss" is a palace, designed more as a residence. As these beautiful castles and gardens span the state of southwest Germany in all directions, driving is one of the best ways to get to many of them in one week's vacation and to allow enough time to book a special tour, linger over a garden, eat a meal in one of the castle restaurants, or enjoy one of the many festivals and concerts and exhibitions, the tourist board noted. 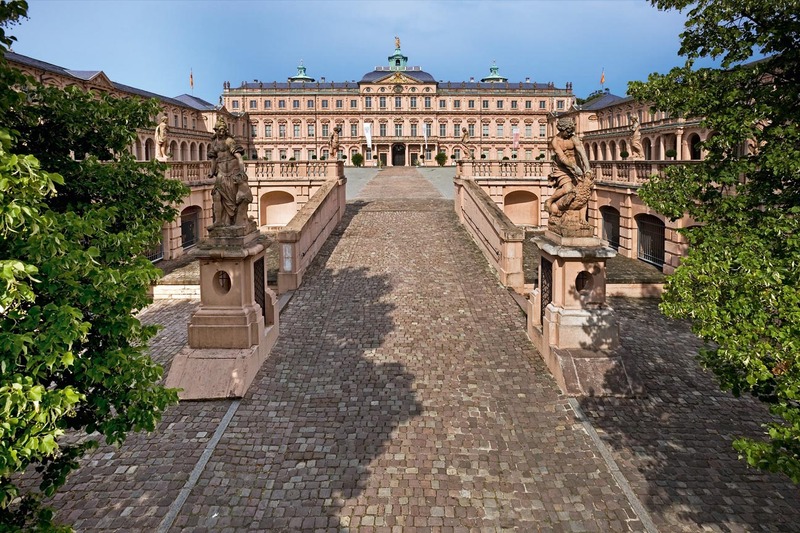 Every year, the Staatliche Schlösser und Gärten renews its programming and adds new and unusual guided tours. 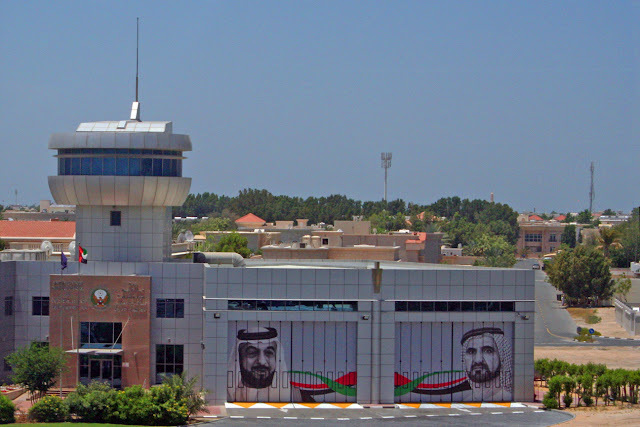 “It might be a stroll escorted by a lady or gentleman in historical dress, applying all their charms and acting skills in transporting you back to their epoch; or it might be a gourmet tour, during which experiencing history is combined with a culinary extra; or, yet again, it might be a ‘behind the scenes’ program, a children's event or a walk by candlelight,” the board said. As a special feature, the Erlebnistag im Kloster (A Day in the Monastery) will open the doors to the lives of monks and monasteries. The event takes place Oct. 8. Three possible routes for enjoying the depth and breadth of southwest Germany's castles and gardens offer different landscapes and points of view and take only about three to five days each to enjoy at a leisurely pace, the board said. The first route starts with the charming city of Heidelberg where the castle's famous façade and ruins leave much for the imagination to build upon and the newly opened restaurant with one Michelin star offers dining under the stars overlooking the city, the university and the Neckar River. Just twenty minutes from Heidelberg, the exquisite and lesser known summer palace of Schwetzingen, in the heart of the asparagus country, offers one of the finest examples of baroque gardens with straightaways, alleys, rows of trees, a natural outdoor theatre, an indoor theater, and delicious food in the castle's orangerie restaurant. Only 30 minutes further is the palace of Bruchsal, the former home of the prince bishops, where they have re-opened the bel etage complete with 38 original tapestrs and over 300 pieces of furniture and art from before WWII. The second route also starts in Heidelberg and follows the same road until it diverges after Bruchsal on the asparagus trail to take in the famous Maulbronn Monastery (where Maultaschen were invented), the sepulchral castle in the wine hills of Stuttgart and heads east to the Swabian Alb and the Wiblingen Monastery near Ulm where Einstein was born. Last but not least, the third route starts in the northeast at Palace Weickersheim. 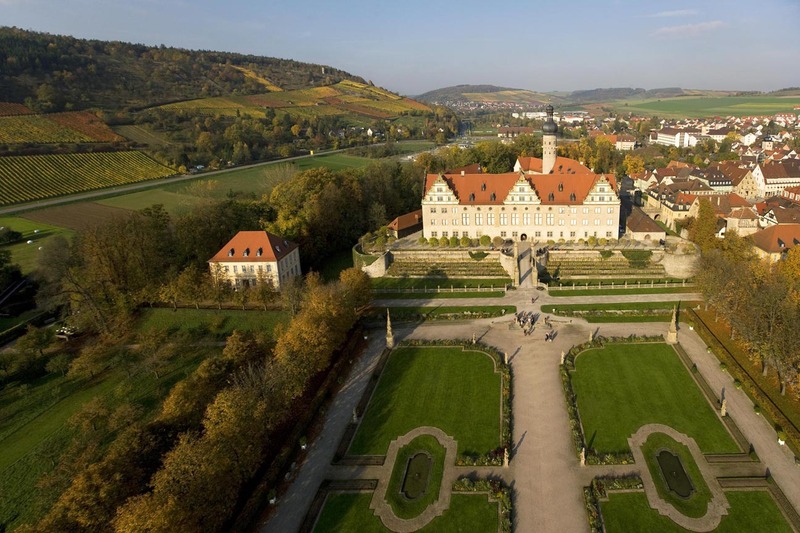 Set in the scenic landscape of the Tauber valley, Weikersheim Palace (Schloss Weikersheim) lies at the heart of the small town of Weikersheim. With its beautiful garden, the palace embodies the Renaissance ideal of a country estate. The richly decorated Rittersaal (knights' hall) dating from 1600 is a highlight of Renaissance architecture, and its vast paneled ceiling, with its colorful hunting scenes, is famous. 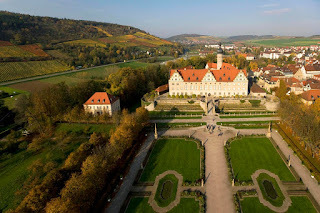 After Weickersheim comes the beautiful baroque castle of Ludwigsburg and Solitude Castle. Built on a superb vantage point at the edge of Stuttgart, Solitude Palace offers a magnificent view across the Württemberg lowlands toward Ludwigsburg in the north. The interior of the palace radiates splendor and is designed in the late Rococo and early Neoclassical styles. Nearby the sepulchral chapel on Württemberg hill (Grabkapelle auf dem Württemberg ) was erected by King Wilhelm I in memory of his beloved wife Katharina, who died at a young age. Offering spectacular views over Stuttgart, this monument to eternal love is considered Baden-Württemberg's most romantic spot. The route winds down lovely countryside through the Swabian Alb and, like Route 2, ends at the Monastery of Wiblingen. Finally, these beautiful castles and gardens are available for meetings and special events, birthdays and celebrations. Visitors can celebrate their birthday in style in a palace, or host their wedding party in a majestic ballroom. These palaces and gardens, ruins and monasteries are exquisite locations for meetings, incentives, conferences and events - or even a film shoot. 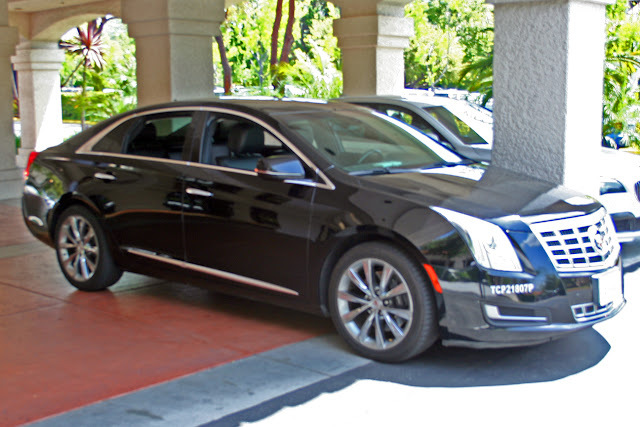 Visitors can spend a romantic holiday driving and visiting the castles and gardens at a leisurely pace, then start planning when to return for that momentous – and surely, unforgettable – event in their life.